I was not raised with a bicycle. Or maybe I had one for 10 minutes when I was 10--before it was stolen. Nashville, at least way back when I was a kid, was not a place for bikes. Munich, my home now, is. It's not Beijing, but it's certainly bike-friendly--or bike-aggressive maybe? 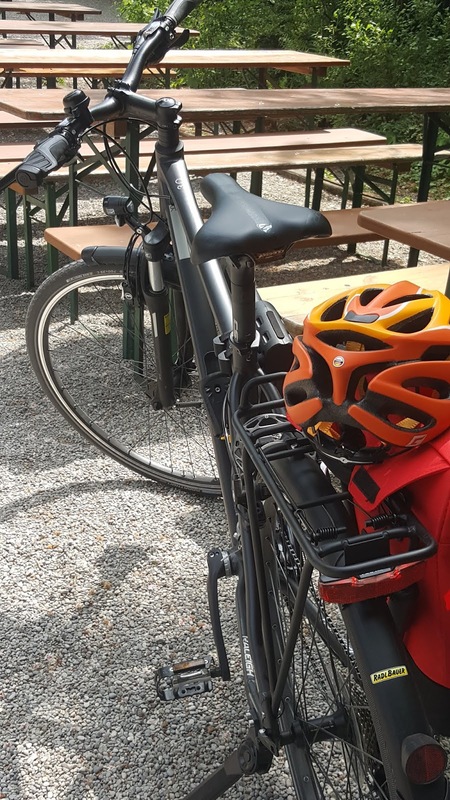 Cycling in Munich is a way to get to work for many people, not merely something fun to do in their free time. The weekend after we bought bikes, Felix the Ballpoint Pen Licker's Assistant and I cycled 20k to the north, 20k to the south, along the Isar River, and then a few weekends ago along the Mangfall river. I have seen more of Munich and the surrounding countryside of Bavaria in the last two weekends than I have in the 23 years I've lived here. On a bike. The last time you visited Munich, you probably had a hotel near the Wiesn--where Oktoberfest happens (in September; please don't forget this) so that you could weave and stumble back to it easily in the early morning hours. You probably lost your cellphone and your wallet, spent at least one evening in the ER, and met some very nice Aussie guy (whom you keep meaning to inform about his child but Australia is so far away and ya-de-ya). You could do Munich differently. You can't have mine, but there are so many places to rent a bike in Munich. You're probably better at finding these places than I am, but here's a helpful link. Several companies have placed bikes around the city. You can rent these with your credit card, but these bikes aren't great. They lack gears, I think, and look kind of stupid; if you're like me, you have an aversion to looking stupid. With a bit more planning, you can look much cooler. The private bike rental shops have better bikes: bikes that are more appropriate for longer tours. I have not downloaded these apps. I leave such things to Felix the Ballpoint Pen Licker's Assistant. My main task is being adorable; I have enough to do. I'm told, though, it takes only a couple minutes to download these things, and apparently they have been instrumental in guiding our bike tours around Munich and beyond. Apparently, with the MVV Cycle Route Planner you can filter for the quickest route or the greenest route. The green routes will take you through parks and forests, which is great if you're a bit apprehensive about cycling in traffic. The quickest route will take you along streets where the bikes lanes are excellent but often busy. If you have no experience cycling in European cities, I'd take the green routes. 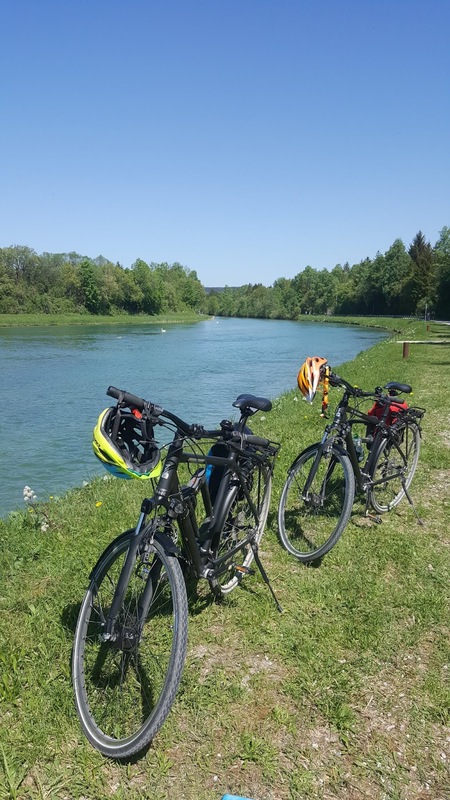 If you are thinking about cycling outside Munich, here's a great APP for that. 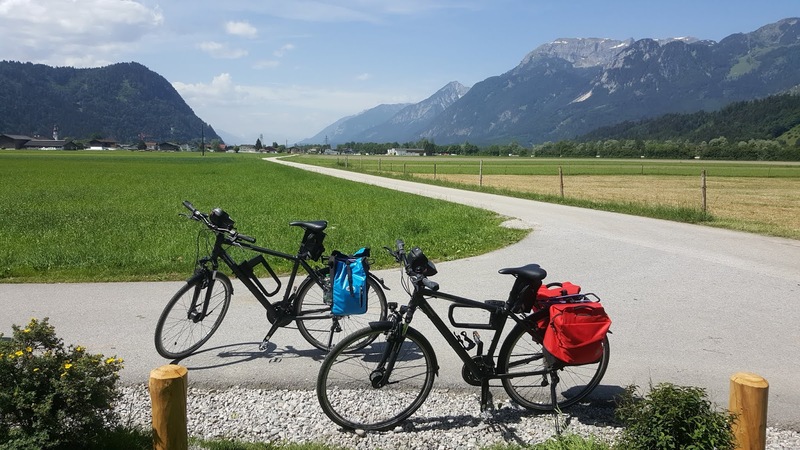 The well-kept bike paths in Bavaria and Austria will take you to breathtaking scenery and quaint little villages. On our way to Innsbruck--OK, this is Austria. Do you have trams in your city? You may call them streetcars; you may be confused right now. Chances are if you're from the US, you know this mode of transport only from storybooks as a quaint, romantic--even magical--beast: a long hollow worm filled with people, crawling and rumbling through a city, eating and vomiting passengers from time to time. It's just wacky, I know. For many European cities, though, this is not a rare animal but rather an accepted and even vital part of a functioning city. Problem is, trams run on tracks that are just deep and wide enough to snag a bicycle tire. If you drive into one, you'll flip your bike and break hopefully only a wrist. You could break your neck. Always drive over tram tracks at an angle to the track. Here's a lovely video that explains in detail the dangers of cycling in cities with trams in Scottish English! Beautiful and very helpful. In cities with narrow streets lined with parked cars, there's always the danger of someone opening a door. You need to be 1.5 meters away from the cars to be on the safe side. So I was going to show you a video of a car door accident, but they're all too upsetting. If you're into that sort of thing, do your own YouTube search. Ouch. Munich's streets are sometimes a triple whammy: narrow streets, lined with parked cars, with tram tracks. If you are at all apprehensive about cycling in these conditions, just get off the bike and walk it to the next street where conditions are better. 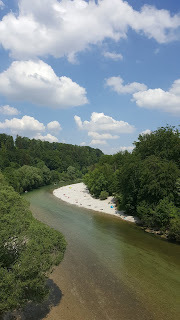 The Isar river provides an enjoyable, often shaded tour through some of the most beautiful nature Munich has to offer. Just be careful when you're near the city. The bike paths are very congested there, especially on the weekends. Cycle just a couple kilometers outside the city and you'll be surrounded by trees, nature--and sometimes naturists. There are also lots of restaurants and kiosks along the way. The English Garden is one of Europe's best and largest city parks. Near the center of the city, the park is very crowded, but the more north you cycle the fewer people and more trees you'll see. 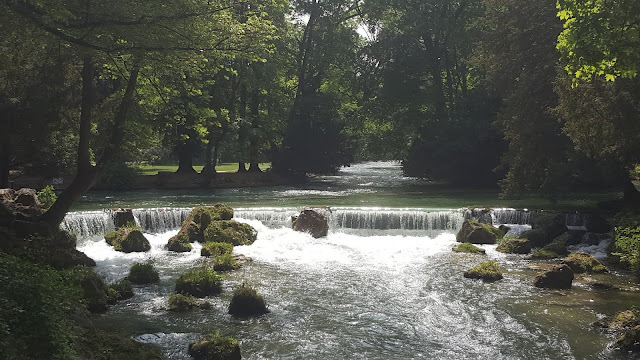 The Eisbach at the English Garden is one of the city's most beautiful attractions. The next time you're in Munich, rent a bike. You'll see more, feel better. Yes, of course drink and sing until 2 a.m. Do that too. Hey! I have a new book out! It's a collection of flash fiction, and it's available in the US on Amazon. It's called Other Household Toxins or Baby if you're adorable enough to buy it. Kathy Fish has said the collection "could well serve as a flash fiction primer," so if you're wondering what flash fiction is, buy my Baby! Christopher Allen is the author of Other Household Toxins (Matter Press) and Conversations with S. Teri O'Type (a Satire). Allen's fiction has appeared, or is forthcoming, in [PANK], Eclectica Magazine's 20th-Anniversary Speculative anthology, Indiana Review, Split Lip Magazine, SmokeLong Quarterly: the Best of the First Ten Years anthology, Longleaf Review and Lunch Ticket, among many others great places. Read his book reviews inNecessary Fiction, Word Riot, and The Lit Pub. His creative non-fiction has been featured in Bootsnall Travel, Chicken Soup for the Soul and others. A finalist at Glimmer Train in 2011, Allen is a multiple nominee for the Pushcart Prize, Best of the Net, The Best Small Fictions, storySouth's Million Writers Award and others. In 2017 Allen was both a finalist (as translator) and semifinalist for The Best Small Fictions. He is presently the co-editor of SmokeLong Quarterly and a consulting editor for The Best Small Fictions 2018.